His name was Robyn Hode. – A Lytell Geste of Robyn Hode (c.1470). 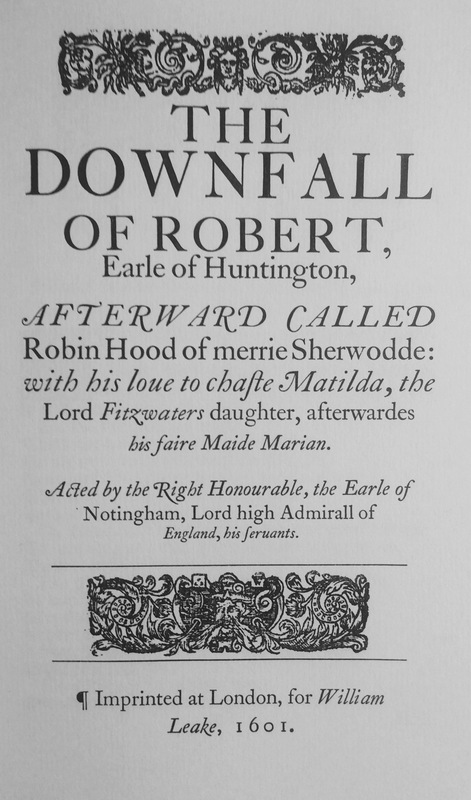 But this situation changed in the the late 16th century in two plays written by Anthony Munday’s The Downfall of Robert, Earle of Huntington (1598), and The Death of Robert, Earle of Huntingdon (1601). These plays are the first time that Robin Hood appears as a distressed aristocrat. They are proper Elizabethan tragedies, and Munday decided not to use the ‘popular’ Robin Hood tradition, where ballads had cast him as a yeoman – a rank altogether inferior to the Earl that Robin Hood became in his plays – in order to appeal to a more courtly Elizabethan audience. The play, as a typical Elizabethan tragedy is static, unmoving. Virtually all the action has been taken out of the Robin Hood story (having action and fighting scenes in the play would have been judged to vulgar). But Munday had written so much material for his Robin Hood plays – detailing so much courtly intrigues and amorous monologues – that he separated them into two plays. 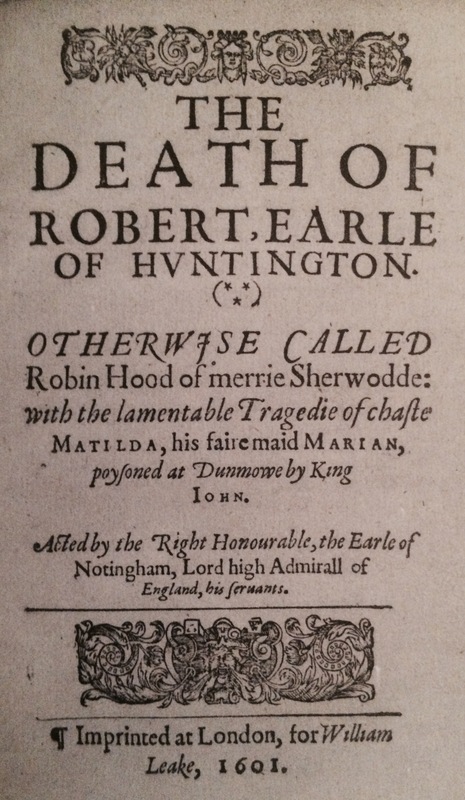 The sequel was called The Death of Robert, Earle of Huntingdon (Munday was helped by Henry Chettle in the writing of the sequel). This, as the title implies, is also a tragedy. In The Death, Robin actually dies by the end of Act 1, and what follows is a lengthy tale of King John trying to win the hand of the fair Matilda (whose outlaw name is Marian). The fact that he is a virtually inactive hero, and that he dies by the end of Act 1 of the second play, effectively marginalises him, although the marginalisation of heroes is common to many Renaissance plays. After reading the play, you get the feeling that, although the play uses his name, it is really a play about politics in the 12th century. 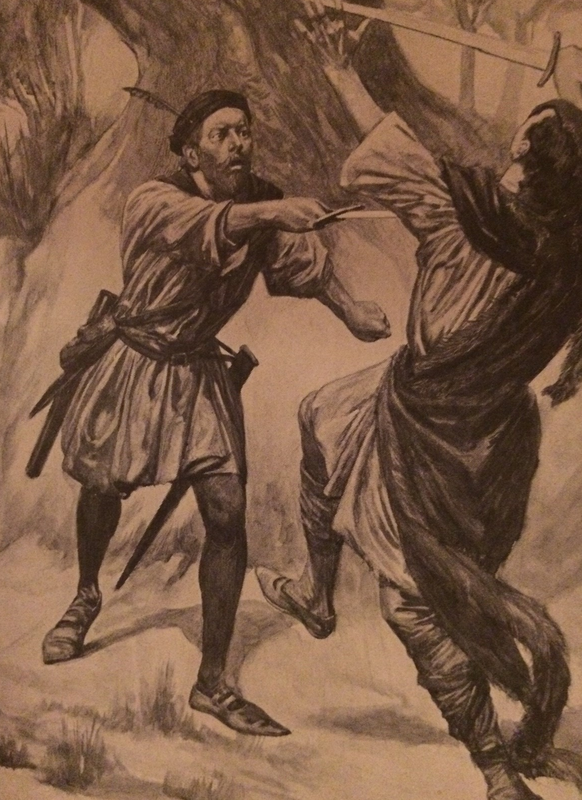 An “active” hero – 19th-century illustration. The other enemies in the play are Catholic clerics – something which would have resonated with viewers who had, under Elizabeth I, seen England go through the Reformation. It was a period of heightened anti-Catholic sentiment, and here was a play, featuring one of England’s best known figures, opposing the Catholic Church – it was going to be a hit! The “Downfall” of Robert refers to the dispossession by his uncle, and it is only after fleeing to the forest that he becomes Robin Hood. As Stephen Knight, a scholar who has conducted extensive research into the legend of the famous outlaw, says, another break with the ‘popular’ tradition is that the forest is presented as the site of aristocratic shame, whereas in the medieval ballad, A Lytell Geste of Robyn Hode (c.1450), the forest represents freedom. What is striking about these plays though is the influence they would have upon nearly subsequent interpretations of the legend.In 18th-century plays such as Robin Hood: A New Musical Entertainment! 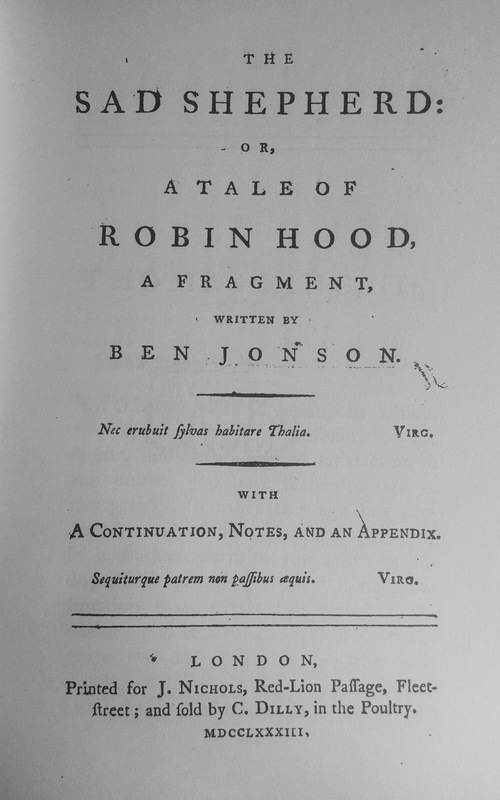 (1751), and Francis Waldron’s continuation of Ben Johnson’s pastoral, The Sad Shepherd; or, a Tale of Robin Hood (1784), the famous outlaw also comes across as a rather passive sort of fellow; he is called “gentle master” by his merry men, and the whole plot of the play revolves around Robin and his men comforting a sad shepherd on the loss of his wife and trying to reunite him with her. Thankfully, in subsequent books, movies, and TV shows, Robin once again became a more active outlaw. But another, more profound effect of the plays, is that the reconfiguring of Robin Hood as a distressed aristocrat seems to have been an idea which subsequent English authors and filmmakers adopted. It almost immediately filtered down into ‘popular’ culture, as the ballad writer, Martin Parker, wrote the song, A True Tale of Robin Hood (1631), whilst criminal biographies in the 18th century would, with one exception, retain the idea that Robin Hood was a nobleman. Even the supposedly radical Joseph Ritson, who is in many ways the father of the modern Robin Hood legend, depicted Robin as an aristocrat. In the 19th century, most of the children’s books and penny dreadfuls about Robin Hood portray him as a dispossessed nobleman. And this intepretation has filtered down also into modern movie and TV adaptations. Even the radical, anti-Thatcherite, 1980s TV series, Robin of Sherwood, succumbed eventually to the establishment when the second Robin Hood of the series, Jason Connery, was cast as Robert of Huntingdon. The two main texts where Robin Hood is once again returned to low birth is Alexander Smith’s A Complete History of the Lives and Robberies of the Most Notorious Highwaymen (1719), and Ivanhoe (1819), written by Sir Walter Scott, who oddly was a Tory, and if anyone would have kept the Robin Hood as aristocrat theme I would have thought it would have been him – something which I can’t quite figure out why. The latest incarnation of the Robin Hood legend, which was last year’s Doctor Who episode, ‘Robot of Sherwood’ similarly cast Robin as an aristocrat and, unfortunately, it does not seem to be an idea that writers and filmmakers will abandon very soon. Stephen Knight, Robin Hood: A Complete Study of the English Outlaw (Ithaca: Cornell, 1994).